Last Saturday was the 7th annual Spot Prawn Festival held at False Creek Fisherman’s Wharf near Granville Island. It starts at 12pm and Pretty Sis and I arrived at 1pm. The lineups were INSANELY LONG when we arrived. Good thing we didn’t pre-purchase tickets either for the Prawn Boil, cuz neither of us had the patience to stand in line. But oh how I did want me some spot prawn though…there was even a lineup to go down to the wharf to get their $12/lbs fresh (but dead) prawns. So what did I do?? 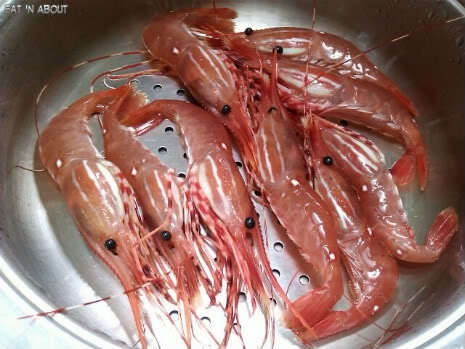 I headed back to Richmond’s City Fresh Supermarket and got me just jumping fresh live Spot Prawns for $9.99/lbs!!! (They’re currently at this price at T&T Supermarket also). Me: About how many are in half a pound? Him: Around 5-6. Here I’ll show you. But it’s so cheap just get a pound! Me: No no it’s only for me. Him: Oh then half a pound is alright. (he then weighs out approx. half a pound). Here is a little more than half a pound. I can put some back if you want. Him: (Hai lor!) That’s right! If there’s a few more then you get to eat a few more! Me: How long is the sale for? Him: Not really sure gah. It should still be on sale tomorrow, but Monday I’m not so sure lah. If you like it then come back tomorrow loh! If the sale’s over on Monday then eat a few less loh!! Yep. That was the conversation. I found it hilarious. Anyways back to the real stars of the night. I briefly rinsed them under the sink when I got home to get some of the dirty tank water off. I screamed when they jumped out of the colander. Twice. To prepare them I just boiled up a pot of salted water. Once it’s at a rolling boil, I just dumped all the prawns in at once (very quickly and closing the lid quickly so they don’t have a chance to jump out). Once the shells turn translucent and the flesh has turned white, I strained them. Boiling them too long will result in mushy flesh. Then for dipping I just used soy sauce with a bit of sugar. They were SO GOOD. SO SUCCULENT and sweet, with a nice chew to them. 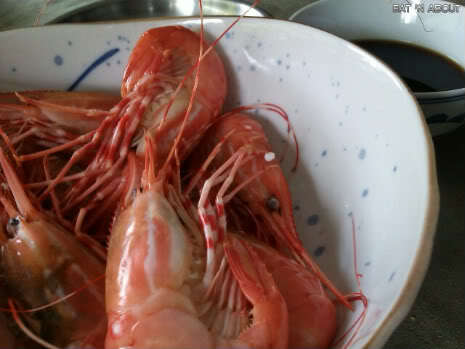 Now I really like how Japanese restaurants, when you have spot prawn sashimi, will deep-fry the heads for you. I don’t have a deep fryer, so I did the next best thing. 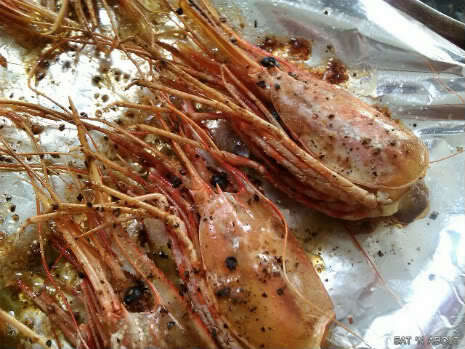 Drizzled with olive oil, seasoned with salt and pepper on both sides, I broiled them in a toaster oven until they were crunchy. Not exactly like deep-fried, but close enough. But I didn’t dare eat the eyes though O_O unless they’re deep-fried. Or maybe it’s cuz I saw those same exact eyes whip back and forth earlier. Next PostGranville Island Tea Company: Best Masala Chai! Best idea ever! 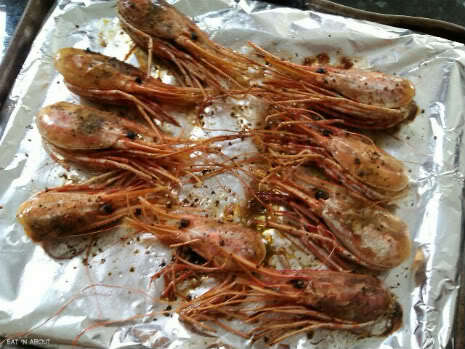 I threw away my prawn heads! Darn! Next time I will do this for sure!